Place an amazing bird of prey on your property using the Jackite Peregrine Falcon Kite. This highly realistic kite soars, beats its wings, and even moves to new positions, creating a striking look that clearly mimics an airborne falcon. The 43.5" wingspan offers realistic size and shape to the piece, and its yellow, brown, and blue hues add definition. These colorful hints lend it a striking bit of detail, and the included, fiberglass rod runs through the body for stability. The durable, Tyvek construction forms a water and tear resistant kite, for use season after season. Its exceptional wind sensitivity means you can fly this kite with as little as 10' and as much as 200' of line, and can mount it on a pole or fly it for a fun afternoon. Display this item on your boat or in your garden, allowing its bold realism to act as a decoy for other birds. 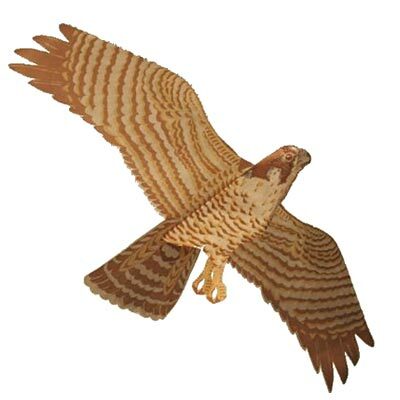 Showcase your love of nature in your backyard or home using this Peregrine Falcon Kite. Some assembly required. Made in the USA. Ninety day limited warranty.